It comes equipped with as high-performance 22x zoom lens, which was specially designed to produce nothing but professional high-def videos. It also has the wide-angle capability of the DVX and HVX series, making the lens offer additional telephoto capability for a 28-616mm zoom range. Aside from 18 elements in 12 groups, the lens has low-dispersion, ultra-high refractive (UHR) glass, and aspheric elements. And because it’s from Panasonic, it comes with CAC or Chromatic Aberration Compensation technology, which minimizes color bleeding in its surrounding images. This results in rich expression through finely rendered nuances and excellent shading. 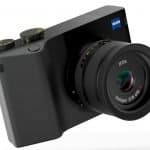 It has three manual rings: mechanical (cam-driven) zoom, focus, and iris, all of which allow you to use the camcorder as if it has interchangeable lens that will allow you to have tactile control over the image’s parameters. If your hands tend to shake after holding a camera for some time, this is the best video camera for you. The AG-HPX250 has a high-tech OIS, which compensates for any shaking. es with Panasonic’s shoulder-mount P2 HD broadcast camcorders. This sensor allows you to maximize the lens’s performance and to ensure that the signal processing circuit is in standard conditions. DRS is responsible for automatically suppressing blocked shadows and broken highlights in shots that need varied contrast levels. For example: indoor versus outdoor elements in a single frame. This technology matches the contrast of each pixel by estimating a gamma curve and knee slope. As a result, the Panasonic AG-HPX250 camcorder produces superb gradation for each shade, while minimizing blocked shadows and blown highlights. 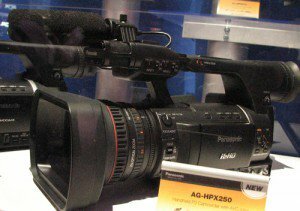 One of the reasons that make the new Panasonic AG-HPX250 one of the top 10 video cameras on the market nowadays is that it comes equipped with a 20-bit DSP handle. This allows for gamma and detail-enhancement functions with uncommon precision. The HPX250 has dual memory card slots that enable you to record continuously without ever worrying about not having enough memory to store your videos. And because it uses P2 cards, instead of the SD cards, allowing you to create backups of your clips simultaneously or using hot-swap support. Additionally, it comes with a file-based recording function that enables you to transfer data fast. The P2 cards also have MXF wrappers, allow you to edit your clips with any major nonlinear editing systems. This also allows you to record videos quickly, without cueing, and protection from accidents, such as data overwriting. If you want cinematic slow-motion and quick-motion effects in a camcorder, then you’ll love the AG-HPX250. It features frame rate variables “overcranked” and “undercranked”. 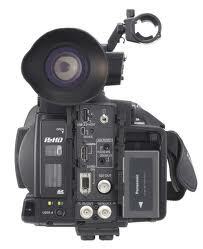 This allows you to record at a wide range of frame rates even in 1080p, just like professional camcorders. This amazing camcorder can record high-quality 16-bit audio on all channels, giving you the freedom to select the audio source for each channel. It has a built-in mic, external mic, and the line in. With the One-Clip Rec mode, you can shoot up to 99 cuts and save them as one file. A text memo will then be automatically attached every time you start recording. This makes it convenient to find your desired scenes within the clip once you’re in the edit suite. Loop Rec, on the other hand, allows you to repeatedly re-record a specific recurring time slot while maintaining a recording of the most recent time. The Pre-Rec mode is for continuously storing up to 3 seconds of HD video (7 seconds of SD video) in standby mode, which will be saved in the P2 card when you press the Record button. This means that even if you miss that crucial moment, you’ll still be able to get the shot. If you want automatic intermittent recording, you need to use the Interval Rec mode. Then, there is the One-Shot Rec, which lets you capture a single frame for animations. When recording HD/SD videos, the SDI output of the HPX250 allows camera-through or high-quality 10-bit, 4:2:2 images when playing back AVC-Intra footage. SDI outputs consist of embedded audio and support Record Stop/Start functions. You can select the Aspect Ratio Conversion if you want to produce SD-SDI down-converted videos from an HD source. An HDMI output is also available for live monitoring and for playing back on compatible HDTVs. 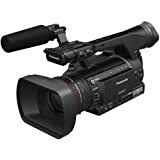 One thing that can’t go wrong with Panasonic AG-HPX250 as it is one of the best camcorder you can find on the market today, is that it is tastefully designed for mobility. 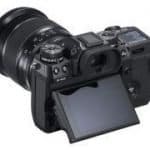 It’s compact and has a similar form factor to HVX200, and better weight balance, enhancing the screen visibility and ensuring comfortable shots for longer periods. What’s more, this video camera has a chassis that is composed of die-cast magnesium alloy for improved durability. If you’re concerned about shooting low angles, with the new Panasonic camcorder, you’ll be able to comfortably shoot in any way you like with its buttons strategically positioned in the design. Case in point: you’ll find the Rec Start/Stop button on the upper part of the handle grip and a lens zoom speed control with three speed levels. If you want multiple options when it comes to offloading, field editing, and cutting, the Panasonic P2 includes numerous decks and mobile storage units, making it the perfect solution for your needs. Plus, its file-based nature enables you to integrate recorded clips into IT-based infrastructure. The video camera’s shutter speed is between 1/6 to 1/2000 second. It also comes with a Synchro Scan function. For the gamma, the matrix setting comes with a Cine-Like mode. Additionally, the H & V detail levels are adjustable, as well as detail coring and skin-tone detail, chroma level, chroma phase, color temperature, and more. Moreover, you’ll be pleased to find out that the best video camera offers four settings for knee point: Auto, Low, Mid, and High. And a Focus Assist button will expand the center of the LCD screen, so you can check for correct focus right on time. You’ll find a focus level indicator on the LCD of the camera. The new Panasonic AG-HPX250 2.2MP P2 HD H is sold between $4,400 and $5,000, or more. 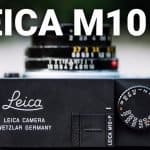 Although it leans toward being pricey, this camera guarantees that your money will be spent on impeccable functionality and cool features that no other brand can offer. Shutter Speed (Preset): 50i/50p mode: 1/50 sec. (OFF), 1/60 sec., 1/120 sec., 1/250 sec., 1/500 sec., 1/1000 sec., 1/2000 sec. 25p mode: 1/25 sec. (OFF), 1/50 sec., 1/60 sec., 1/120 sec., 1/250 sec., 1/500 sec., 1/1000 sec., 1/2000 sec. 60i/60p mode: 1/60 sec. (OFF), 1/100 sec., 1/120 sec., 1/250 sec., 1/500 sec., 1/1000 sec., 1/2000 sec. 30p mode: 1/30 sec. (OFF), 1/60 sec., 1/100 sec., 1/120 sec., 1/250 sec., 1/500 sec., 1/1000 sec., 1/2000 sec. 24p mode: 1/24 sec. (OFF), 1/60 sec., 1/100 sec., 1/120 sec., 1/250 sec., 1/500 sec., 1/1000 sec., 1/2000 sec. Slow Shutter Speed: 50i/50p mode: 1/12.5 sec. and 1/25 sec. 25p mode: 1/6.25 sec. and 1/12.5 sec. 60i/60p mode: 1/15 sec. and 1/30 sec. 30p mode: 1/7.5 sec. and 1/15 sec. 24p mode: 1/6 sec. and 1/12 sec. Shutter Speed (Synchro Scan): 50i/50p mode: 1/50.0 sec. to 1/250.0 sec.